The series is Mental Marginalia and there’s no real significance to the name other than giving something a good name is really difficult and this was the first thing that we (Mark Gurarie and Alex Crowley) both said “yeah!” to. there’s a notebook somewhere with like 30+ awful names in it. It was founded in 2011 by Mark and Alex, and soon we’ll be turning over the reins to Sarah Madges. It’s primarily poetry, though we have had a few fictioneers along the way. As Sarah takes on the normal series duties, we (Mark & Alex) are going to branch out into multimedia events of some sort. We don’t really know what that’s going to entail yet, but it’ll be poetry plus other stuff (maybe music and comedy and visual art? who knows). Usually it’s 4 readers with a little halftime break. Also, we always start 30-45 minutes later than we say we will, which is a nice touch. It’s monthly, though we’ve taken breaks here and there. But for the most part we’ve been on a solid monthly schedule. The day will likely change with Sarah, but that’s about it. We have also done collaborative events with Birds, LLC and The Operating System, and we co-hosted AWP off-site readings in Chicago and Boston (with LIT, the journal of the New School’s writing program, of which we’re all alums). We have a wordpress blog that we stopped updating after a few months because nobody really cared. Otherwise we’re on twitter @mentalmargin and Facebook. A combination. When we first started we just asked people we knew, but within a couple months we had people emailing us with submissions and it’s been a combination ever since. Not really. We didn’t think we’d last 6 months, nevermind go for 4 years. It’s been a place where newer/younger/up-and-coming poets could get some experience in front of a crowd or people with more experience could come try new material or promote their books/chapbooks or whatever. We’ve hosted a pretty wide array of writers with wildly different aesthetics/concerns as well as backgrounds. Our extremely relaxed attitude towards professionalism, probably. We’re very fortunate to have a very supportive home at The West, they treat us well and our readers well. We’d like to think we’re a welcoming and open and safe space for both the readers and the audience. 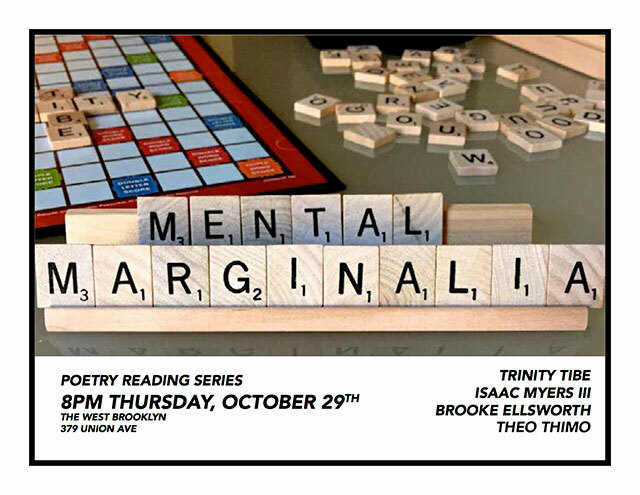 The next Mental Marginalia is scheduled for Thursday, October 29, 2015 at 8p.m. at the West and features Theo Thimo, Trinity Tibe, Isaac Myers III, and Brooke Ellsworth. Check out photos from Mental Marginalia’s August 2014 reading on the English Kills Review Tumblr.